Liquid concentrate free of aldehydes, phenols and QAC for the non protein fixing cleaning and disinfection of medical/dental instruments and rotating precision instruments. Excellent material compatibility with endoscopes as well. Tested at instruments of company Komet, furthermore approved and recommended by Acurata, Busch & Co, Dentsply Maillefer, VDW and many more. The extremely high corrosion-inhibiting properties could even be improved by the QAC-free formulation, thus instruments sensitive to corrosion get optimal protection. BIB forte eco is completely free of aldehydes and phenols, highly effective, safe to use and economic (application solution at 0,5 to 4 %). BIB forte eco is extremely compatible with materials as it is free of QAC and alkalis, chlorinated hydrocarbons and halogens. 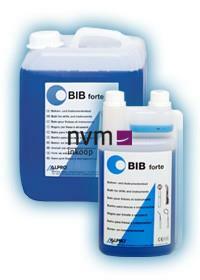 BIB forte eco is biodegradable according to OECD. - modern combination of alkylamine and guanidine.